You’re not alone. Several new research studies reveal that marketing managers are under increased pressure to show measurable results from their social media efforts. In a survey of 700 marketers from all over the globe, Wildfire App discovered that nearly all marketers find value from social media and that 75% of marketers plan to increase their media spending in 2012. The top two benefits highlighted by these marketers are increased brand awareness and the ability to engage in dialogue directly with their customers. 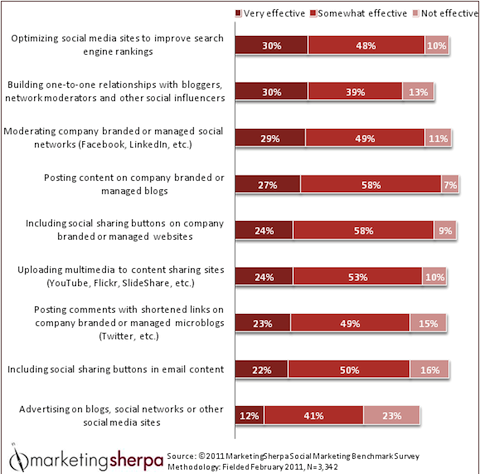 This compares similarly to the 2011 Social Media Marketing Industry Report where we found 88% of marketers also indicated increased exposure to be the number-one benefit of social media marketing. Wildfire App also found that social media brought increased sales and reduced spending. Small businesses have reached a tipping point in social media use where only 10% of small businesses surveyed in the Ad-ology 2012 Marketing Forecast said they would not use social media marketing in 2012. That’s down from 24% in 2011 and 39% in 2010. 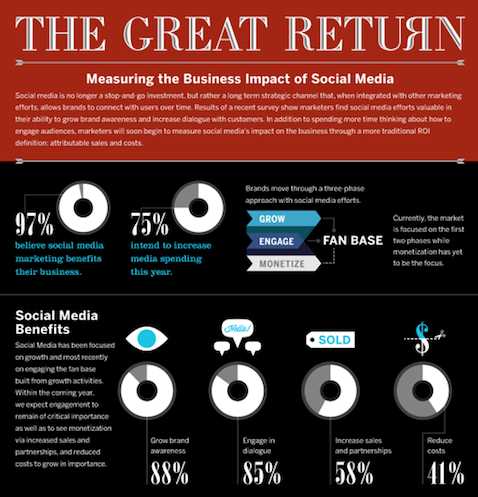 As you look at these results, where has your business benefited the most from social media? Borrell Associates found that small- and medium-sized businesses (SMB) will double their social media advertising budget in 2012. That’s up to an estimated $2 billion in the U.S. alone. 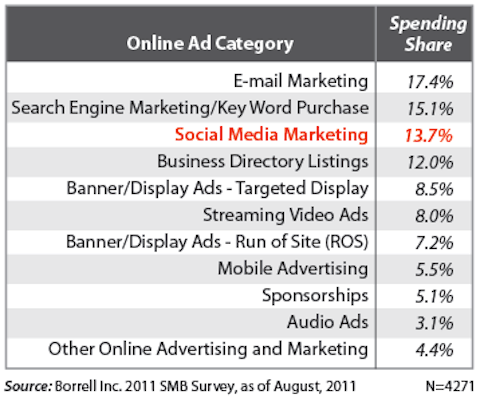 Borrell found that social media marketing ranks third in online advertising spending. 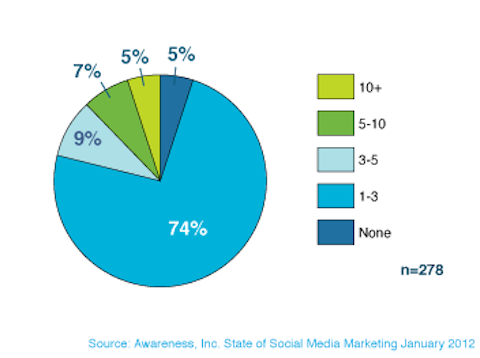 Awareness Networks found in their State of Social Media Marketing study that 70% of businesses plan to expand their social media presence, while half of marketers intend to improve their social media management practices and tools. Content marketing is also important to marketers. Although businesses are increasing their investment in social media, they are more reluctant to put large advertising budgets toward it. Awareness found that 75% of businesses spend $10,000 or less, with most businesses solely investing people’s time toward the effort. 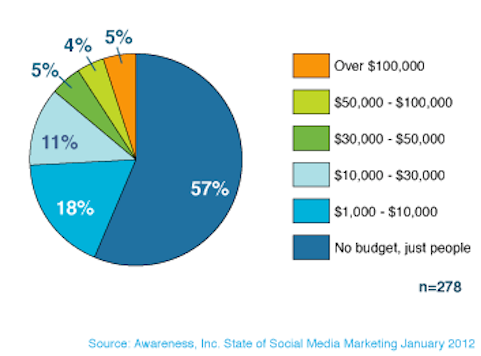 Here's how much businesses are spending on social marketing. Even with people being the primary resource dedicated to social media, most businesses are only employing a small staff for their social efforts, with nearly three-fourths of businesses using 3 or fewer employees. 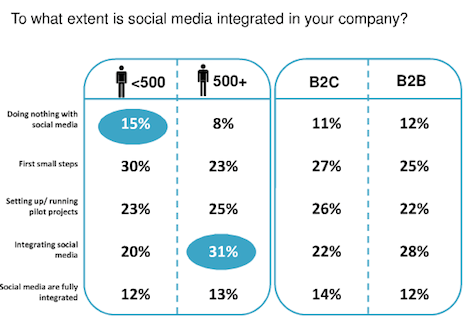 Number of dedicated social marketing employees within companies. With limited budgets and staffs, it’s no wonder that marketers found resources to be their number-one challenge to their social media efforts. 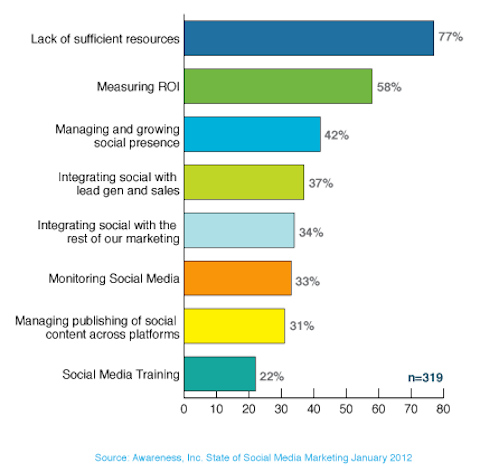 Top challenges faced by social media marketers (reported by all levels within the company). Have you moved past the experimentation stage with social media marketing? What value are you seeing from advertising? Awareness found that marketers from companies of all sizes, experience levels and positions shared the same struggle in accurately measuring the ROI for social media marketing. As a result, nearly half of the surveyed marketers are not purposefully measuring their social efforts. By the end of 2012, Awareness expects four out of five companies will be actively measuring their ROI for social media marketing. This compares similarly to research conducted by Altimeter Group of big brands using social media. They found that a vast majority of brands don’t have a thoughtful social media measurement system in place. Few companies have a consistent measurement framework in place—including over half of enterprises with an "advanced" social media capability. 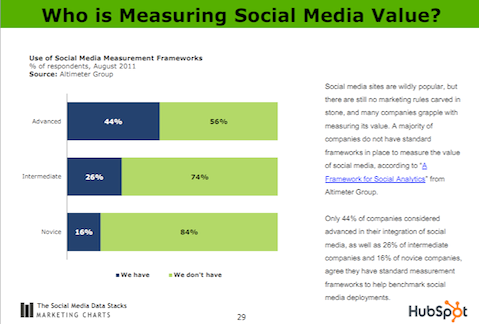 So What are Companies Measuring? What is Working? Awareness found most businesses know how to track their social presence and traffic, but the confidence declines when measuring lead generations and sales. What metrics do you use for your business? 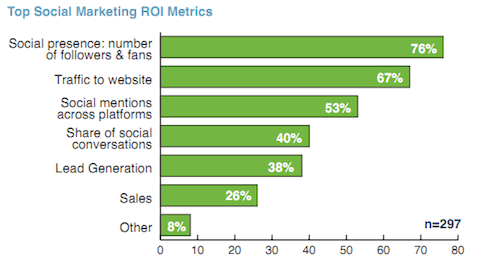 A series of white papers from HootSuite on measuring social media ROI, co-authored by Nichole Kelly. An article Nichole Kelly wrote for Social Media Examiner on 8 metrics your business should consider. A review of Altimeter’s measurement framework I wrote. As an interesting contrast to a company’s perception of social media’s value, Marketing Sherpa surveyed marketing agencies to understand how they calculate the value of social media for their clients. The survey found that social media clearly helps search results for many businesses, but the largest majority of companies benefit from posting content on their company blog. This is especially helpful when integrated with social sharing buttons. 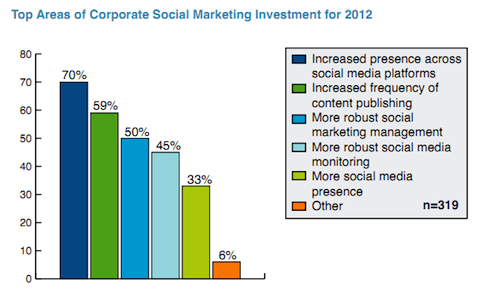 This survey perhaps clarifies why many businesses are reluctant to invest their advertising dollars on social sites. Marketing agencies see the least value derived from advertisements. Advertising is the least effective social strategy, according to marketing agencies. Have you incorporated social sharing buttons throughout your website? What is your content sharing plan for 2012? Have you given social advertising long enough to truly test it? How does your experience with advertising compare to these marketing agencies? Insites Consulting conducted some new research with over 400 senior-level marketing managers in the U.S. and U.K. They learned some fascinating things about social media adoption rates, but here we focus on their integration findings. 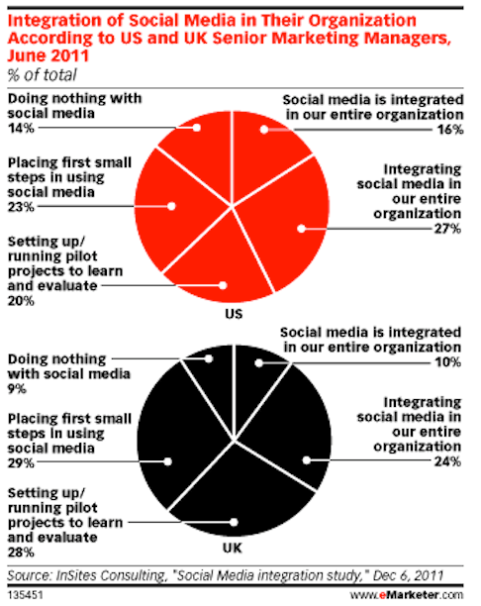 Significantly less than half of the enterprises surveyed have fully integrated social media into their business processes (or are even in process of doing so), 43% of U.S. firms and 34% of U.K. firms responded. A full 57% of U.K. businesses are just getting started or are evaluating the effectiveness of social media strategies, compared to 43% of U.S. firms. Most surveyed businesses have started using social media. Notice there is little difference between B2B and B2C. The key observation made by Insites is that firms that have integrated social media into their regular business operations are seeing significantly greater financial results than those that have not. Key Takeaway:If you’ve determined how your business can best benefit from social media marketing, integrate it fully into your business operations. It may be time to stop dabbling and see social as a serious business strategy. How does your experience compare to these studies? Leave your questions and comments in the box below.